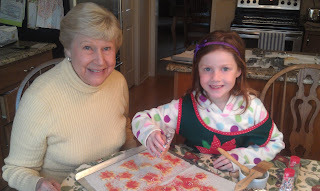 Grandma and Abbie baking Christmas cookies! Today's post is a shout out to Grandparents. Grandparents offer so much support. Grandparents support parents in many ways; some financially, some with babysitting, some just with love and care. The lessons grandparents impart to your children are invaluable. They have more life experience than you do. They may look at things differently, but exposing your children to other viewpoints is a healthy way to promote tolerance. They love your children, and focusing on the positives in the relationship rather than the shortcomings is the key to happiness. I have worked with many families who for a variety of reasons find their relationships with the grandparents strained. If you find yourself estranged from your children's grandparent, I challenge you to find a way to reconnect. Put your differences aside and try to focus on the bigger picture. Try to be the bigger person. Stretch yourself in an effort to reinforce to your children that family ties are important and should be respected if not treasured. Your children may connect with your parents in a fresh new way and allow you to see this relationship in a new light. The bottom line is that blood truly is thicker than water. In times of strife, family members are the ones that "have your back". Do you do enough to nurture these relationships? Do you teach your children to value them? Try to put differences aside and be a loving example of tolerance for your children. Grandparents by nature will not be around for ever...so do your best to establish these precious relationships before it is too late. You and your children will benefit.